syslink has just released version 6 of Xandria - its SAP performance monitornig and system management solution . The new version natively supports SAP Web Dispatcher, Business Communication Services, and Transport Management Services. Besides these, there are more than 1000 new functions and improvements. Most changes compared to its three-year-old predecessor syslink Xandria 5.2 happened under the hood, though. The management agents have been re-implemented, and so have been major parts of the server architecture. Both share the same common event-driven and multi-threaded design already known from the master and gateway components. According to participants of the closed beta program, the new implementation is more responsive and a step forward in overall performance. Likewise, it allows syslink Xandria to provide improvements to the Notification Management. Alerts triggered by the management agents are correlated and processed centrally and may initiate actions performed by the triggering agent. This feature is sometimes referred to as self-healing and allows, for instance, to restart an application server in case a certain error occurs. We've also introduced new types of notifications. Browser notifications and Apple push notifications to draw attention to the GUI or the XanMobile app immediately. 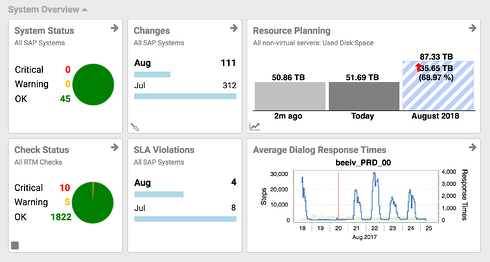 Monitoring for SAP HANA, introduced with the previous syslink Xandria version and extended to the SAP S/4HANA Business Suite early this year, has evolved further. The new Parameter Validator supports the operation of SAP HANA especially in regulated environments with high-security demands. Finally, we've launched a new set of improvements that provide even more convenience in the business of SAP Basis Administration. Users can initiate a SAPGUI logon, start an RDP session on the target server, or open a terminal directly from the syslink Xandria GUI. Learn more about Xandria here.